Some of us are yet to start and still thinking of the right time to begin (Is it the right time to invest in the stock market? Click here). Today, with lots of technology, there are tons of experts and advisers who flood the market with their opinions and suggestions. There are multiple Whatsapp groups, Facebook communities, Twitter & many platforms with stock gurus claiming 100% success rate for their stock picks. Stock Brokers send sms time and again giving Fundamental and Technical tips for short, medium and long term. Many experts change their stand based on the market movement. Big big technical words are used and poor retailers get even more confused. Here is a nice small story which can set you thinking of the dynamics of the stock market. I read it long time back and I'm sure you also might have come across the same. But it is a wonderful thing to read and it will bring you to the reality of the Stock Market. Enjoy the read. Once upon a time in a village, a man appeared and announced to the villagers that he would buy monkeys for Rs.10 each. The villagers were ecstatic since there were tons of monkeys in the nearby forest. The villagers, sensing this unique opportunity, went out to the forest and started catching the monkeys with ease. The man bought thousands at Rs.10 and as supply started to diminish, the villagers stopped their effort. After a month, he further announced that he would now buy at Rs.20. This renewed the efforts of the villagers and they started catching monkeys again. The offer increased to Rs.25 each and the supply of monkeys became so little that it was an effort to even see a monkey, let alone catch it! The man now announced that he would buy monkeys at Rs.50. However, since he had to go to the city on some business, his assistant would now buy on behalf of him. 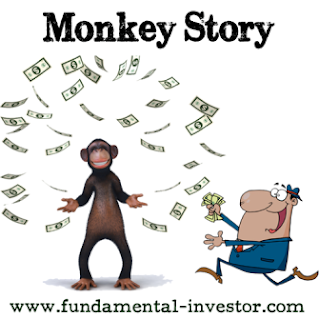 The villagers rounded up with all their savings, took heavy loans and bought all the monkeys. Then they never saw the man nor his assistant, only monkeys everywhere! The monkeys had to let out and they went back to the forest. The villagers were left high and dry and they lost complete trust in life. They had huge loans to pay and they had absolutely no idea how meticulously they got trapped. If Stock market experts were so expert, they would be buying stock, not selling advise. Have an amazing weekend ahead.. Here's an overview on what is the stock market. Stock market is a recognized marketplace where buyers and sellers trade freely by making economic transactions of stocks or shares. (rofl) brilliant story FI Bhai..